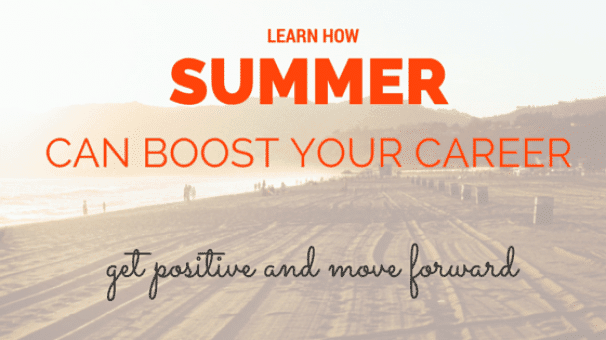 How Summer Can Help Boost Your Career! How summer can boost your career! It’s summer time – yay! Let’s wear our flip flops, put ice cubes in our drinks and dip our toes in the water. The relaxing mode of summer can make us lazy about our big plans and career goals…or, it can help us move our careers forward. Feeling relaxed can help us think more broadly about our challenges and be more open to new solutions. Have you ever come back from a vacation with new clarity about a problem that had been bothering you? Summer also affords us an opportunity to feel and express gratitude for where we are and what we have. Savour the warmth of the sun on your face, or take your cool drink to a shady spot and breathe in the scents of nearby flowering bushes. Enjoy the light-filled evenings with a walk or a bike ride. Here’s where the real difference can come in……. Start to notice your thoughts and feelings, not in judgement, but just as an observer. Barbara Frederickson, the author of the book, Positivity, has spent years researching and studying positive emotions. She and her colleagues have discovered scientific evidence that proves there are things we can all do to overcome negativity. Hers is not a Pollyana approach; it acknowledges that it is normal and useful to have some negative emotions. Yet the power we have to increase our positive emotions can have huge results in our lives. Dr. Fredrickson’s research indicates that a positivity ratio of 3 to 1 is a tipping point. This ratio divides those who merely get by in life from those who truly flourish. The 3-to-1 ratio of positive vs. negative thoughts can help us actually achieve our career dreams. You probably already know that anxiety and depression restrict our thinking. In fact, these conditions make us “stupid,” unable to move forward in our lives. But when we recognize, encourage and repeat positive emotions, we can use this knowledge not only in our creative work, but also in how we choose to explore and shape our careers. Actively practicing positive thoughts and feelings can shift your mindset and enable you to generate better career ideas. Our positivity is not static. It varies from day to day, week to week. What can you do this summer to increase positivity in your life and career? I’d love to hear your ideas. Leave a comment below.